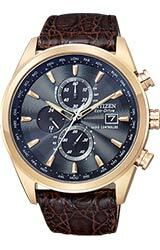 Citizen Eco-Drive Limited Edition Radio-Controlled Chronograph World Timer. Limited Edition of 2,500 with crocodile strap & inscribed caseback, in leather box. Automatic time in 26 world cities; radio-controlled accuracy in 5 zones. 1/20 second chrono measures up to 60 minutes, perpetual calendar, power reserve and non-reflective sapphire crystal.